The Toll Plaza Level is a group of sub systems that operate in the Toll Plazas. It includes all the Hardware and Software necessary to control the exploitation of toll lanes and obtain all the relevant information. It also has the necessary elements for collection control. The Toll Plaza level contains all the necessary Hardware to control the exploitation of the toll lanes and obtain all the relevant information. It also includes the necessary elements for collection control, and even for maintenance and diagnosis of the lanes hardware and software. A server standard device, placed in the Toll Plaza manages all the data relative to it. The Software runs under Windows 95/98 and Windows NT, except for the Toll Plaza server that only runs under Windows NT Server or superior to it. 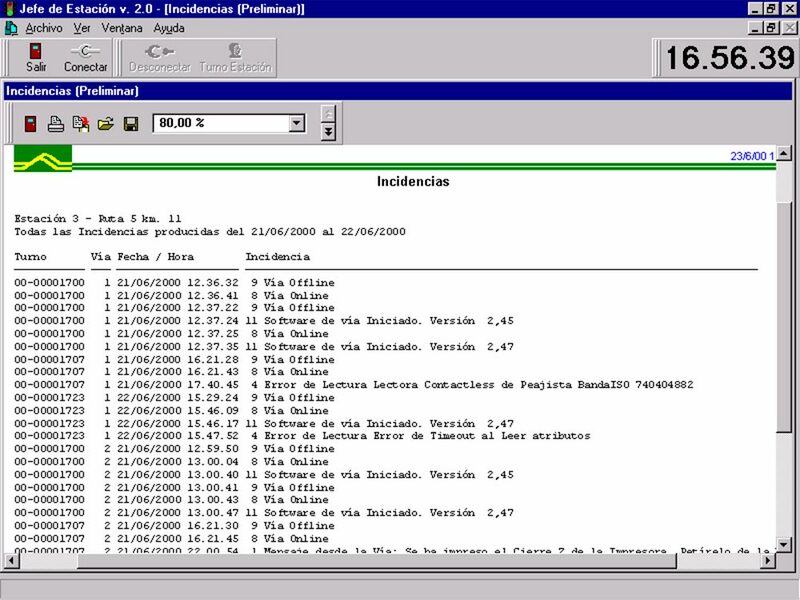 The Software as well as the Hardware has Y2K compatibility for the integral operation of the system. The Toll Plaza Server is the main element of the Toll Plaza. 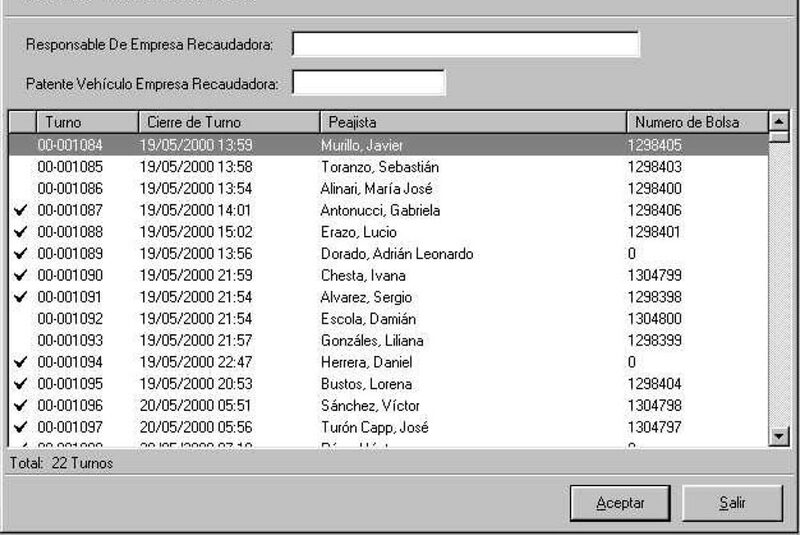 It has many “Clients” such as: its monitor, Plaza Manager, Settlement Client and Lane Maintenance Client. It should also be added to this list the corresponding Lanes of the Plaza. The server creates a dedicated process to each client to be connected. – To manage the reception of messages coming from the lanes. – To manage the delivery of orders and messages to the lanes. – To control Shifts and Sub-shifts. – To keep the lanes status updated. – To generate files of corresponding data automatically. – To generate a back up file of communication with the lanes. It allows to get connected to a Toll Plaza as long as the user has access to it. Once the Toll Plaza is selected, the client allows viewing a detailed graphic of it. This allows – on the detailed Toll Plaza graphic- to perform diverse operations that depend on the exploitation status of the lane. Besides, it can see the information relative to shifts, collection, incidents, etc. 1. Indicator bar of the present shift and name of the working supervisor. 7. Online/offline Lane Indicator (if the lane were offline i appears crossed out with an X). 8. Toll Plaza. This chart represents the toll plaza. Here you can see the way and number of vehicles that arrive in ascendant or descendant way in the past hour. 9. Incident visor. In this visor all the lane and Toll Plaza incidents taking pace along the day are listed. If you want to see this listing go to item 5.2 Incident listings. 10. Tabulation. It indicates the category that the boot operator has tabulated. 11. DAC Discrepancy. This indicator shows the Toll Plaza supervisor that the vehicle that a¡has just left the lane belonged to a different category than the one the booth operator categorized. Note: The number of Toll Lanes and their characteristics will depend on the Toll Plaza we are connected to. – Lane status and devices monitoring. – Remote Opening of a lane, only AVI. – Lane or lane shift closing independently to its operation mode. – Message delivery to the lanes operators. – Visualization of the lanes’ properties. Note: The remote device operation will be performed only by te Toll Plaza supervisor working at that moment. 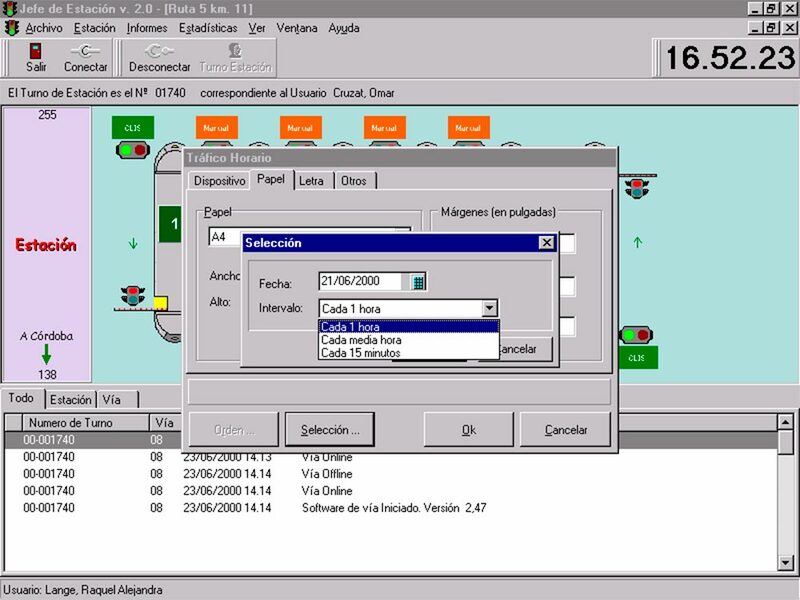 The Toll Plaza manager allows to send the Opening and closing lane and the closing Shift telecommands. These are particularly useful for the AVI mode lanes operation. It will be possible to send reports related to the Toll Plaza traffic, as well as reports relevant to lanes’ incidents. The Toll Plaza Closing Balance client is the software component in charge of comparing the collection declared by the booth operators with the one detected by the system through the lanes transits information. It allows the booth operator to set ho may units of each denomination, as well as of other complementary Closing Balance details such as bag number and seal, number of documents, cash change, etc he has. – Rendering and shift handing to the Collecting Company. 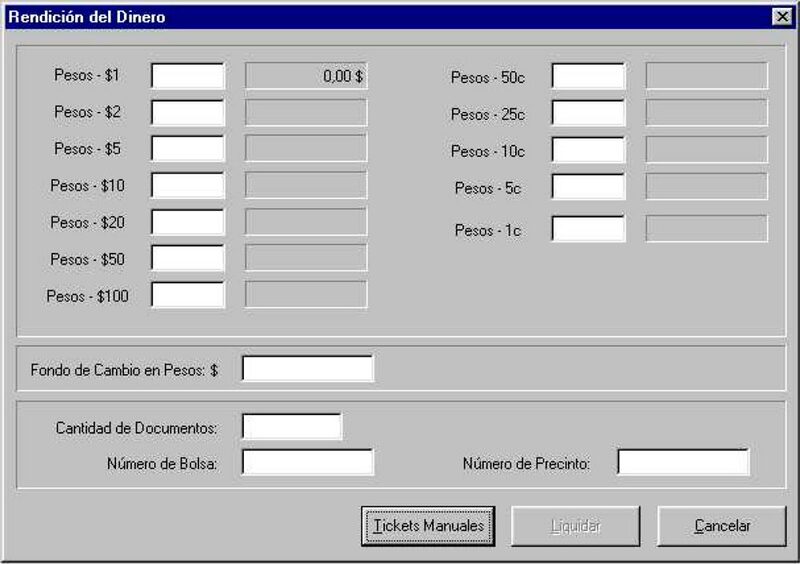 After closing the shift, the booth operator will hace to render the collected money during the shift operation. Once closed, the shifts will be ready to be rendered to the collecting company. – Toll Plaza to which the sift closed balance belongs. – Closed balance shift number. – Opening and closing date and time of the settlement shift. – Name of booth operator that worked in the closed balance shift. – Bag and seal number where the money was deposited. 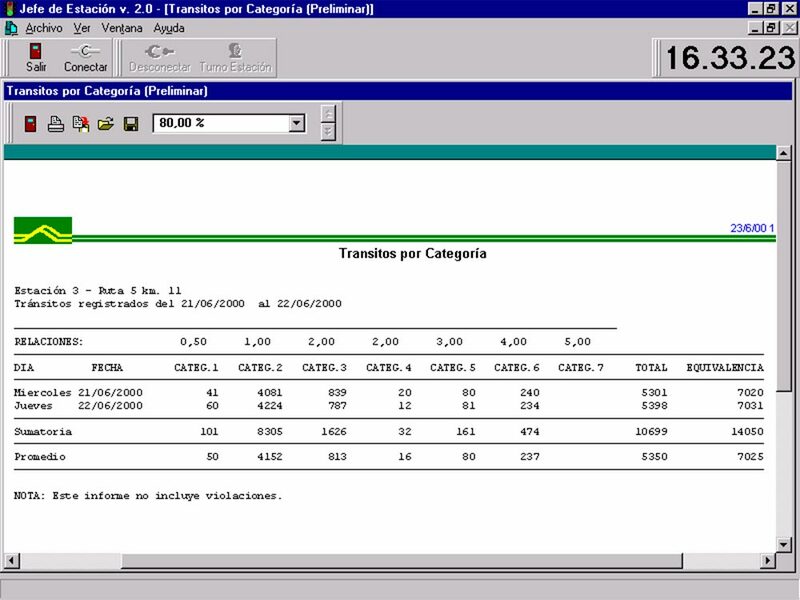 – Amount declared by the booth operator. – Amount registered through the lane system. – Difference between what the booth operator declared and what the lane system recorded. – Amount collected through contactless cards. – Amount collected through credit cards. – Amount collected through tags. 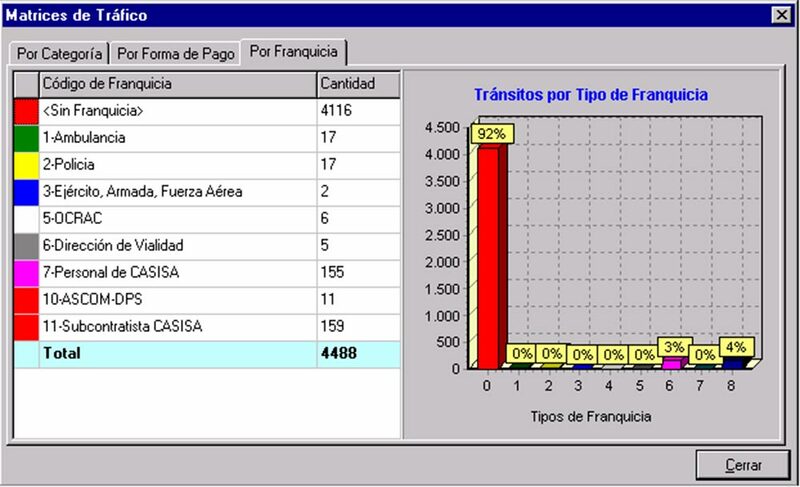 – Number of registered transits. – Room to perform operations. – Booth operator’s and supervisor’s signature. This report must be issued every time one or more collections are delivered to the Transport Company and must be signed by the collector and the supervisor in charge of it. – Toll plaza that issues the delivery. – Issuance date and time. – Name of the supervisor that is involved in the collection delivery. – Name of the company and plate number of the collector vehicle responsible for transportation. – Number of shifts delivered. – Name of booth operators in charge of the shift delivery. – Bag and seal numbers. – Number of bags and declared amounts delivered. The Maintenance client is apparently similar to the Toll Manager client. It has a graphic representation of similar characteristics, by means of which it is possible to operate with the lane elements. However, it is not possible to perform operations related to Exploitation. 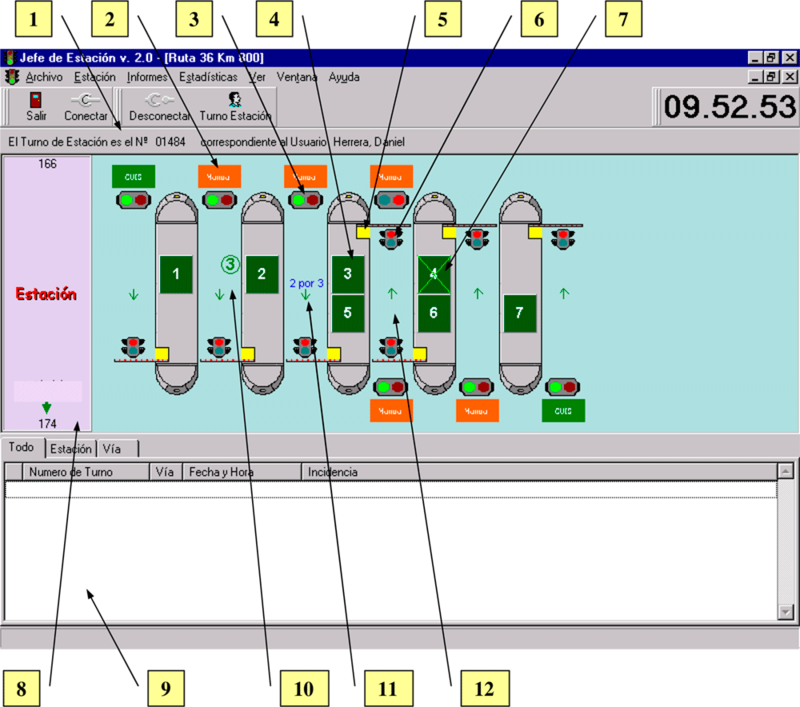 – Monitoring of a lane operation and configuration. – Search for registered incidents. Its basic aim is to allow the maintenance staff to check everything about lanes, specially the hardware. 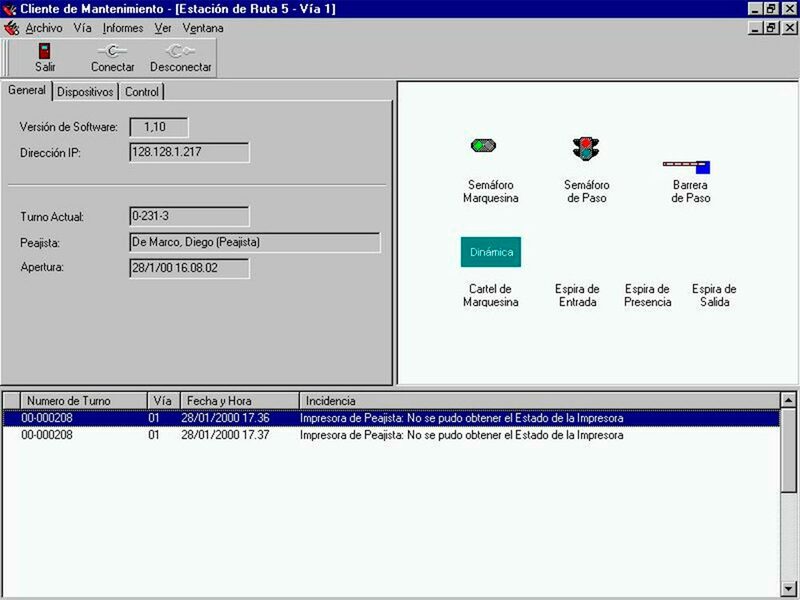 On the left hand side of the screen, there are three files for the visualization of the lane information and control. – The software version used in the lane. 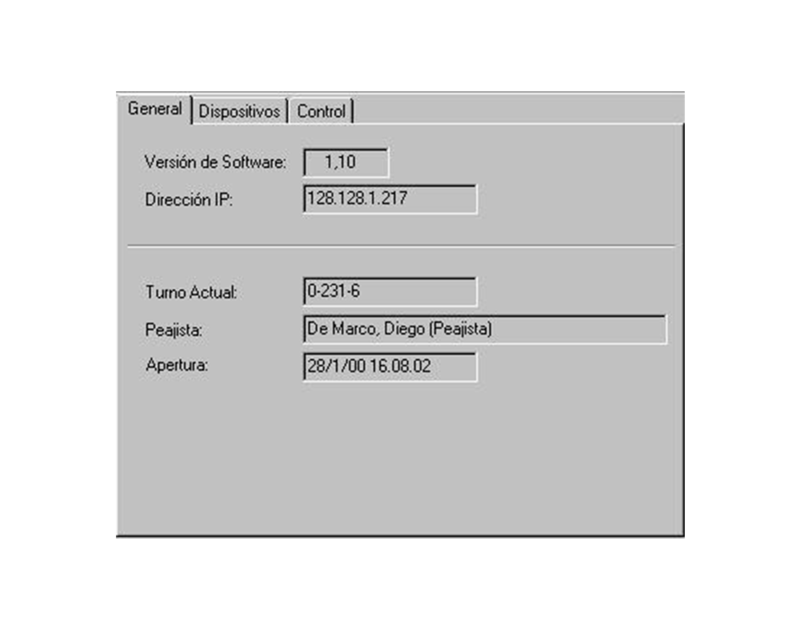 – IP address of the lane controller. – Code of the lane present shift (see Manual Toll Plaza Chief Client or shifts assignment). – Toll Plaza operator’s name working in the present shift. – Opening date and time of the present shift. – Device: Name of the device. – Performance: Device actual performance: normal, degraded or faulty. – Controller: Device Controller Name. – Library: AVI Library File Name used by the controller. When you click on the verifying box “Show Null devices (emulated)”, all the devices that have been emulated for this lane (which in fact don’t exist) will be also listed. Note: The lane software will always emulate all the devices that could exist in it; that is to say, if a device does not exist in the lane, this will be emulated as normal. 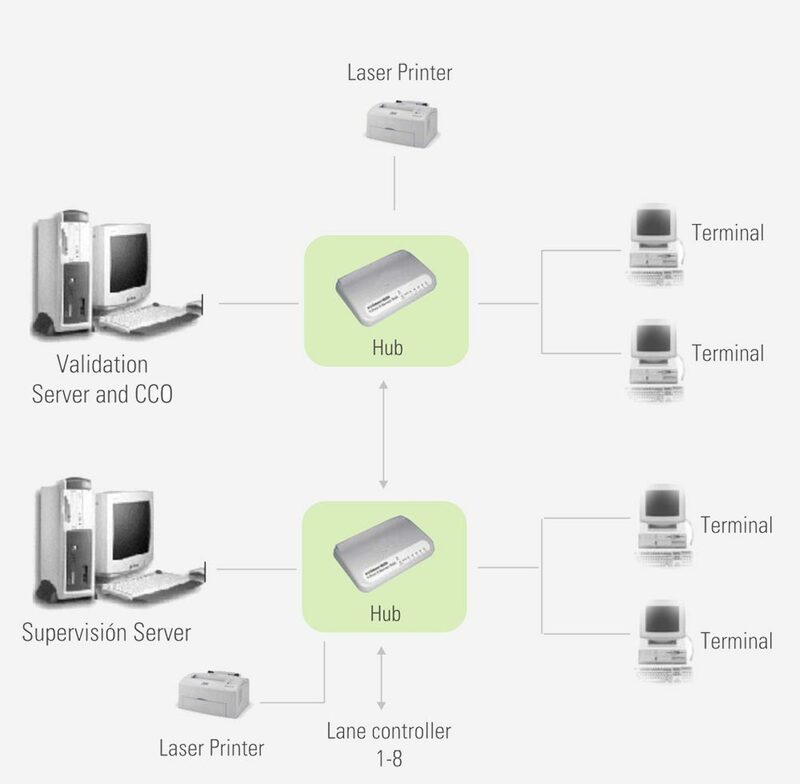 It allows sending telecommands to the lane devices so as to verify the correct operation. But if the lane is open, it is not possible to send telecommands that alter in any way, the configuration or status of any lane element. – To reinitiate the software: It reinitiates the program that is using the selected lane. 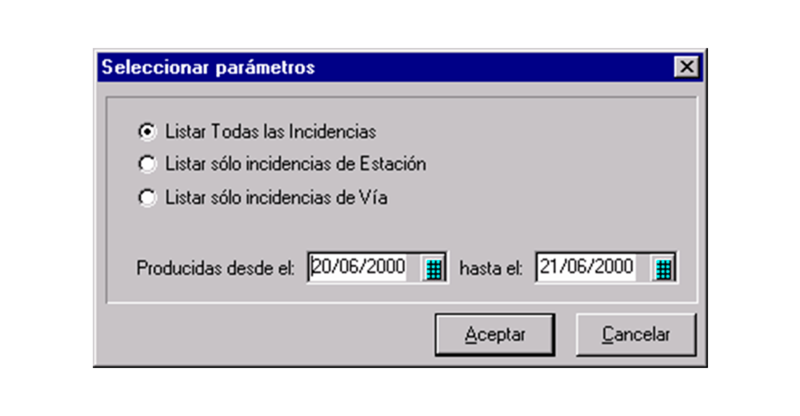 – To reinitiate the lane hardware: It reinitiates the hardware of the selected lane. This option restores the configuration of the selected lane devices. – To switch off the lane: It switches off the selected lane. – The booth operator sends a message to the Toll Plaza. – The booth operator has pressed the alarm button. – The payment mode has been rejected. – The lane has turned to “on line”. – The lane has turned to “off line”. – There has been an error in the lane hardware. – The lane was closed unintentionally, or because of an internal error. This report contains the number of vehicles registered in the selected time-term, and grouped by categories. This report contains the number of vehicles registered in a selected time term, grouped by ascendant and descendant transits. – Number of transits registered by category and way (ascendant and descendant) in the period of time selected. – Total of ascendant transits registered in the period of time selected. 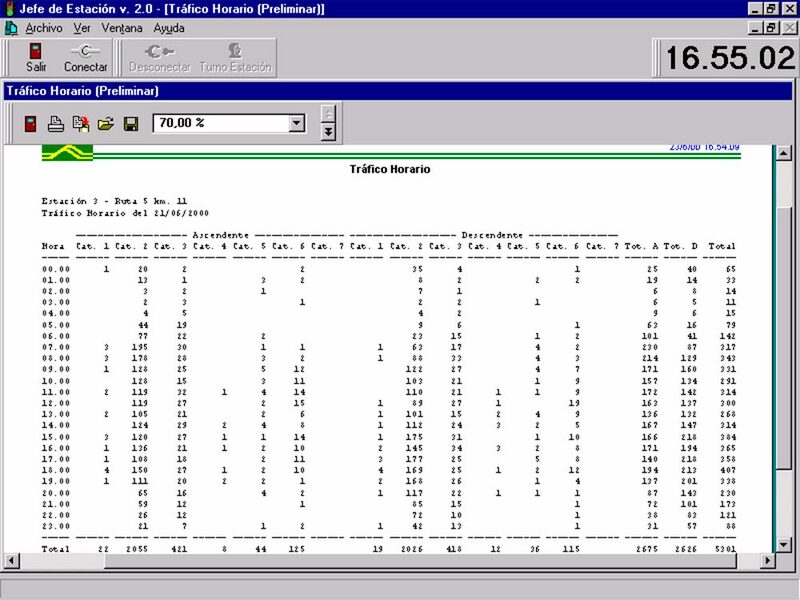 – Total of descendant transits registered in the period of time selected. 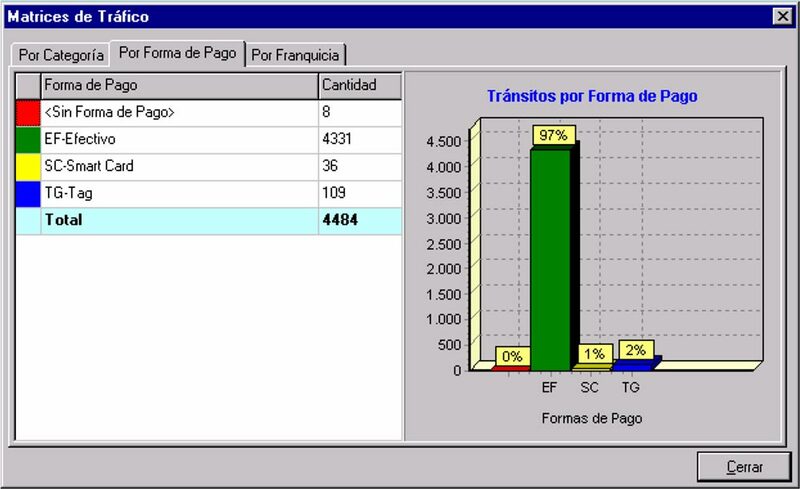 – Total of transits registered in the period of time selected. 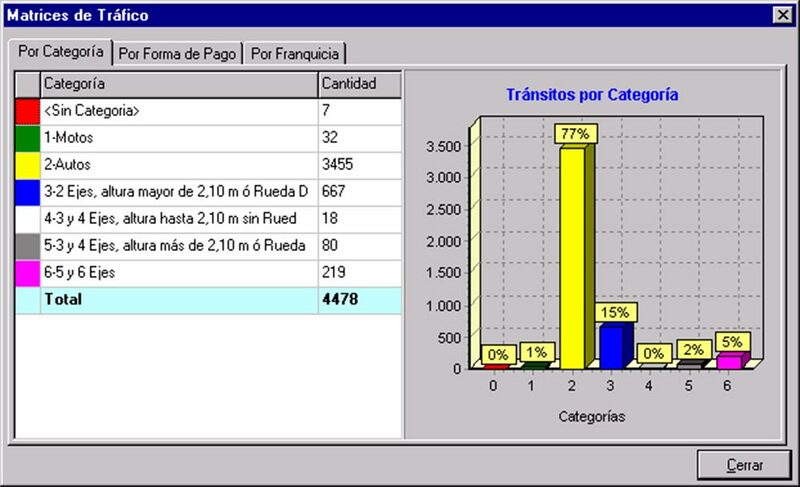 – Total of transits registered by category and way. This report contains all the Toll Plaza and lane incidents occurred during the selected date range. – Shift during which the incident occurred. – Number of lane where the incident occurred. – Date an time of the incident. – Code and description of the incident.